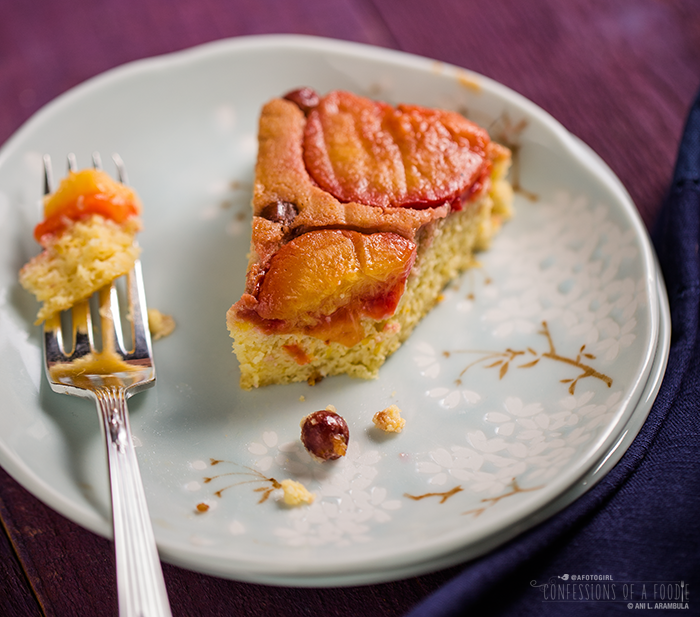 This recipe for Almond Olive Oil Fruit Cake is nutty, lemony, sweet and tart all in one bite. 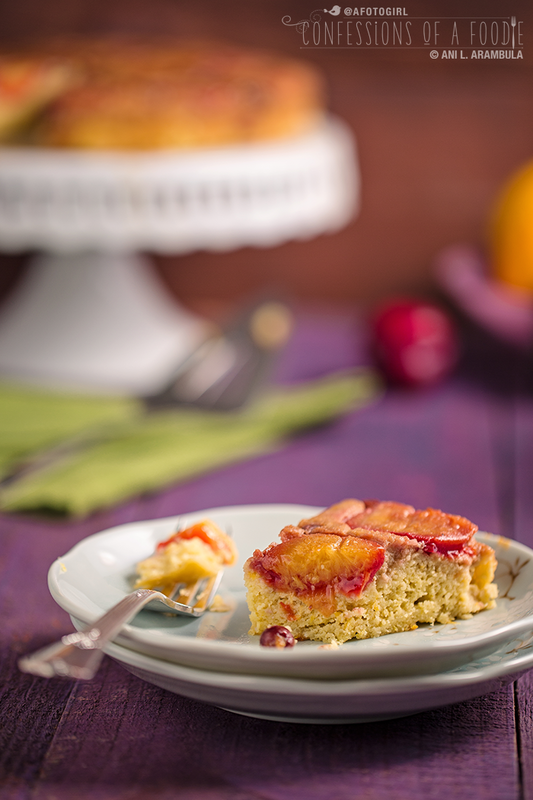 Meyer lemons, plums and champagne grapes make up the "fruit" part of this delicious, low carb cake. **This post is sponsored by Melissa's Produce to benefit Alex's Lemonade Stand: Foundation for Childhood Cancer. Close your eyes. Imagine the excitement that surrounds the impending birth of your first baby girl. Imagine the joy in your heart as you prepare to celebrate her first birthday. Are you with me? Now imagine being told by your pediatrician that your beautiful baby has cancer. Then, the day after her fourth birthday, the doctors say the tumors have returned and your little darling goes back into the hospital for a stem cell transplant. Now, your little girl has become your little warrior and upon leaving the hospital, announces that she wants to help her doctors fight cancer. She decides to raise the money with a lemonade stand. By the time your little inspiring warrior reaches 8, her lemonade stands have inspired other communities to participate and the monies raised by them reaches $1 million. That's what happened to Liz and Jay Scott who's daughter, Alex, finally succumbed to her battle with cancer at the age of 8 but not before spawning a movement of awareness about childhood cancer that has now reached hundreds of communities across the nation each holding their own Alex's Lemonade Stand events to help fund research. 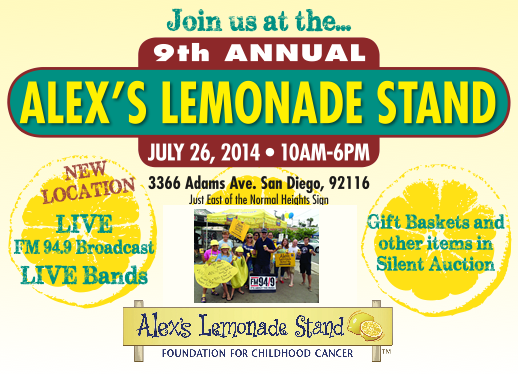 Alex's Lemonade Stand returns to San Diego. When: Saturday, July 26 from10:00 a.m. to 6:00 p.m.
Where: 3366 Adams Avenue, 92116 at the Masonic parking lot. Details: FM 94.9 will be broadcasting live the entire duration of the event. In addition to the lemonade, there will be live music, a silent auction, kid's activities, and more! This lemonade stand is the biggest fundraiser in California and one of the top ten Alex's Lemonade Stands in the country. Since its inception, Alex's Lemonade Stand has raised over $80 million for childhood cancer, and has funded more than 450 research projects at 94 institutions. They also help families struggling with childhood cancer through a Travel Fund and an annual Educational Symposium. If you can't attend but would still like to help, make a donation on the event page. Your donation of $50 funds one hour of research. Let's help the Miller Tribe reach their goal of $15,000 this year, getting them to $100,000 for the nine years they've been running the stand. 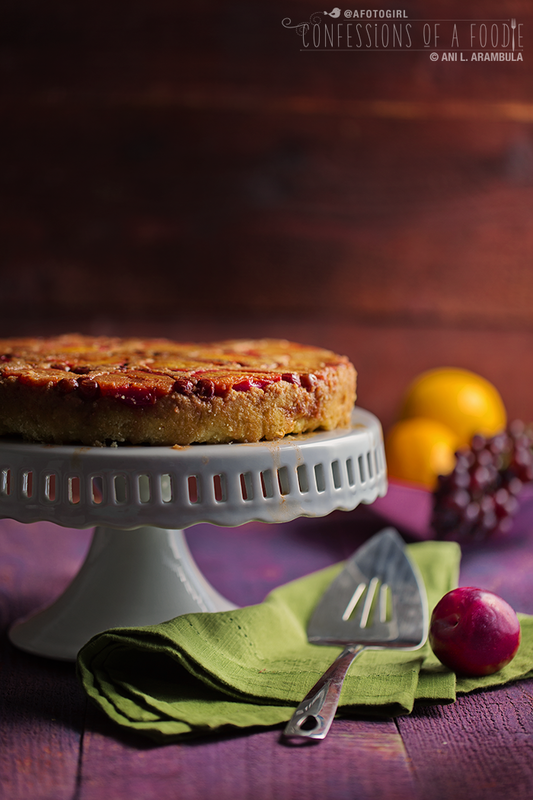 Meyer Lemon-Scented Plum and Champagne Grape Upside Down Olive Oil Cake. Yes, I know, that's a mouthful but it's now 1 a.m. Monday morning and have run out of time to think of a clever name. 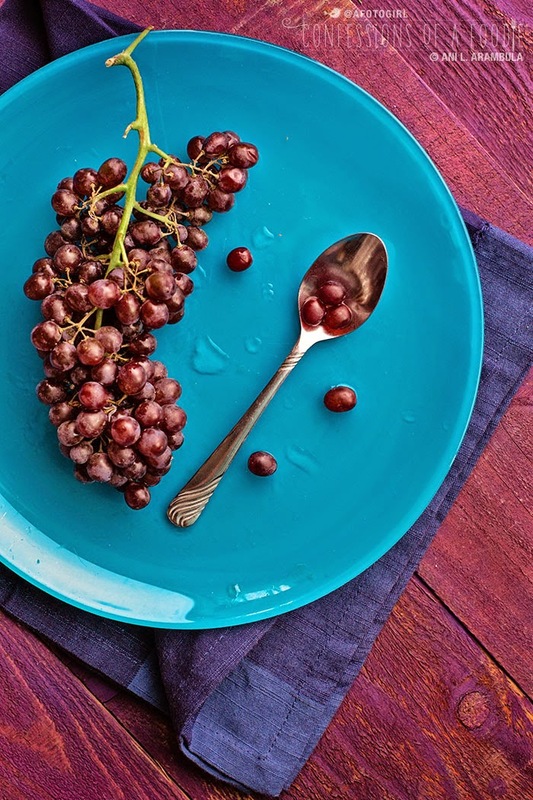 Champagne grapes. These babies are juicy! And tiny! Smaller than a pinto bean. 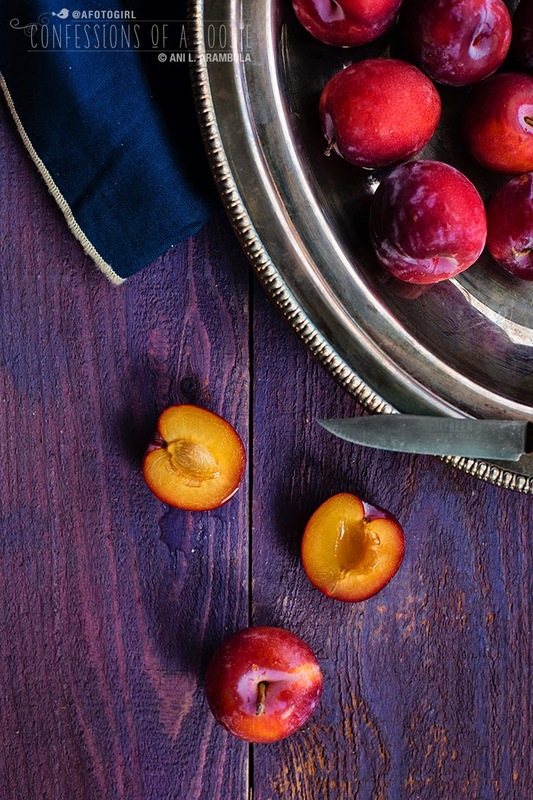 Organic plum bites. Loved these little guys. After mulling over the ingredients for a few days and knowing that lemons had to for sure be incorporated into my recipe, I opted to make a fruit cake. But not the hard doorstoppers you find at Christmas time and hope you don't get. No, I wanted to make one that was filled with the tastes of summer. Last month, in an effort to feel better and get my health issues under control, I went cold turkey off all white food: no white flour, no white sugar, no white rice, no starchy vegetables and no processed foods. It's amazing how much you learn to appreciate the flavors of real food and fruit when you've broken your addiction to white sugar. And this produce did not disappoint. The smells, textures, sweet and tartness were front and center from the moment I opened the box. So I was totally up for the challenge of baking with no white flour. Instead, I've used sprouted whole wheat flour and almond flour. Of the produce sent to me by Melissa's Produce, I used the Meyer lemons, the organic plum bites and the champagne grapes. Definitely making this cake again. 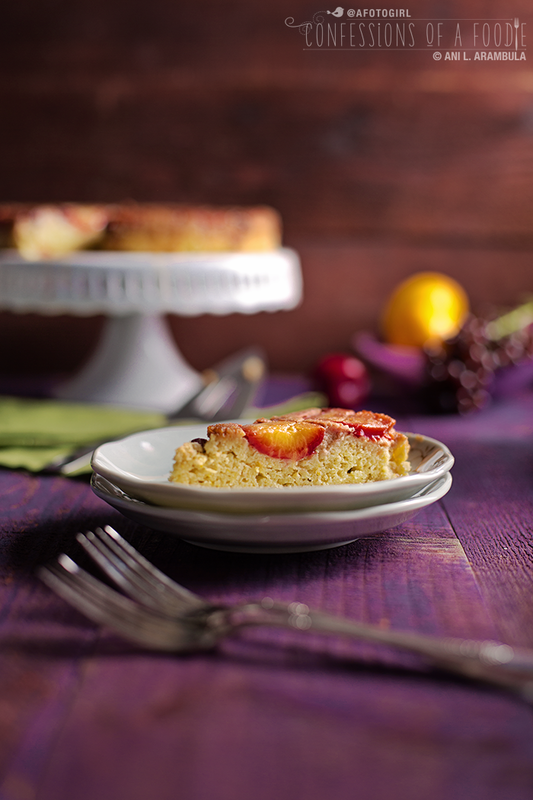 The texture is not light and fluffy like white flour cakes are as I used mostly almond flour but it was slightly nutty, lemony, sweet and tart all in one bite. 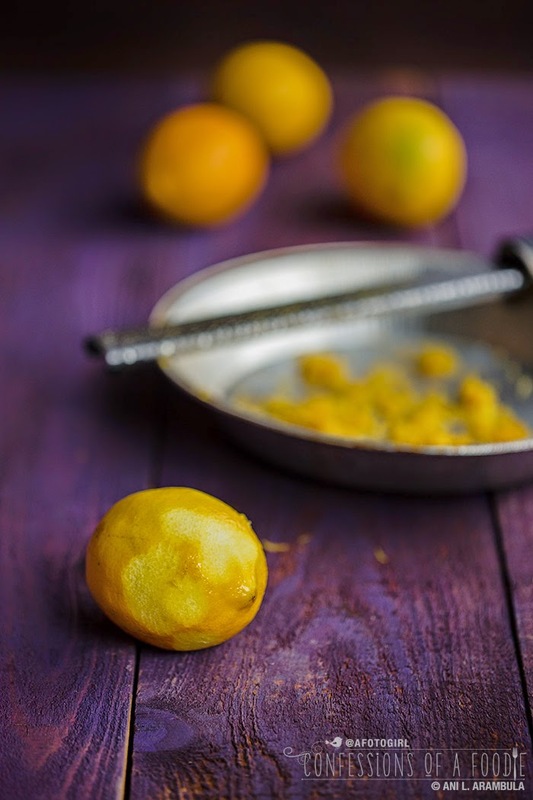 More than a dozen San Diego Food Bloggers will be cooking with lemons in support of Alex's Lemonade Stand. 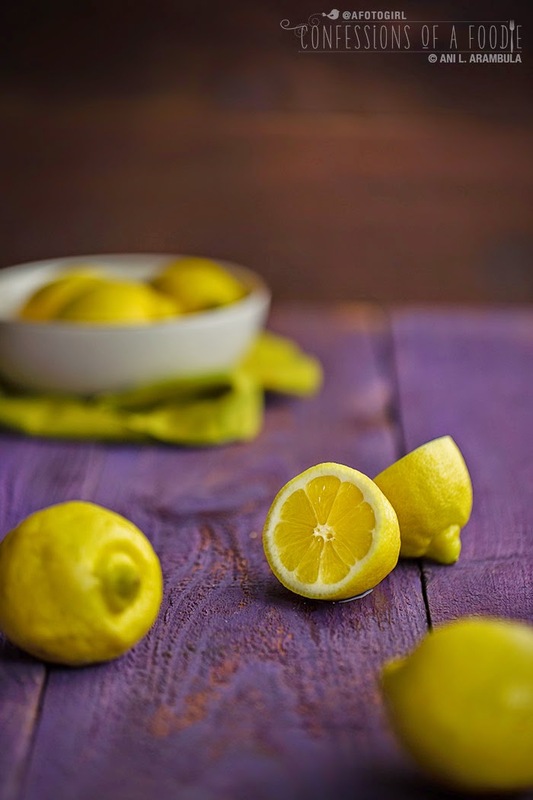 Check out their lemony recipes posting today thru July 28. 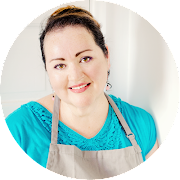 All of their recipes will be linked at the end of this post, too, as they appear on their respective blogs. 2. Trace the bottom of a 9-inch cake pan onto baking parchment paper, cutout parchment and set aside. Butter the bottom and sides of the cake pan; place the parchment on the bottom of the pan, then butter the parchment paper. Holding the pan vertically, place 1 tablespoon of the almond flour on to the inside rim of the pan, swirl pan so that the flour coats the sides, shake excess off. Sprinkle half of the brown sugar in the bottom of the pan. 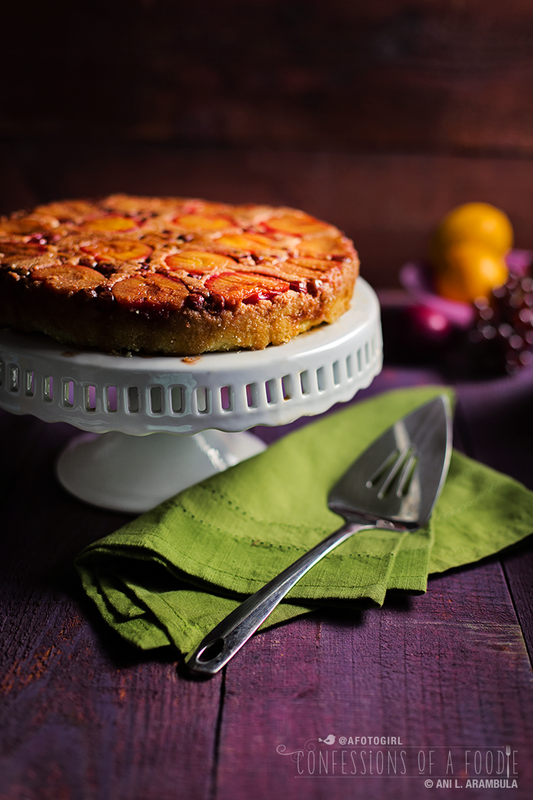 Starting closest to the sides of the pan, place the plums, cut-side down, in a circle spaced evenly apart. Make a second circle inside the bigger one until all plums have been placed. Sprinkle the grapes over the plums, filling in the gaps. Then, sprinkle the remaining brown sugar over the fruit. Set pan aside. 3. Whisk the flours, baking soda, baking powder and salt together in a large bowl. 4. In a separate medium-sized bowl, beat egg yolks, Splenda, olive oil and vanilla until smooth. 5. Make a well in the center of the dry ingredients and add the yolk mixture. 6. Whip egg whites in a clean, dry bowl with an electric hand mixer until stiff peaks hold their shape. Carefully fold the whites into the batter a third at a time until smooth and incorporated. 7. Add the batter to the pan, spreading it smooth with a rubber spatula. Bake for 30-45 minutes, or until a toothpick comes out clean, on the center rack turning the pan halfway through to ensure even baking. Remove from oven and allow to cool in the pan for 10 minutes before flipping out onto a cooling rack or serving plate. Remove parchment. Cake is best the day it's made but will hold in a cool room at room temperature covered for a day or for three days refrigerated. A special shout-out to Melissa's Produce for letting us combine the San Diego Food Bloggers Summer Fruit Challenge with the awareness campaign for Alex's Lemonade Stand. And to Stephanie Weaver of Recipe Renovator for organizing. Until next time friends, please consider making a donation to Alex's Lemonade Stand either by showing up in person or online if you can't make it. 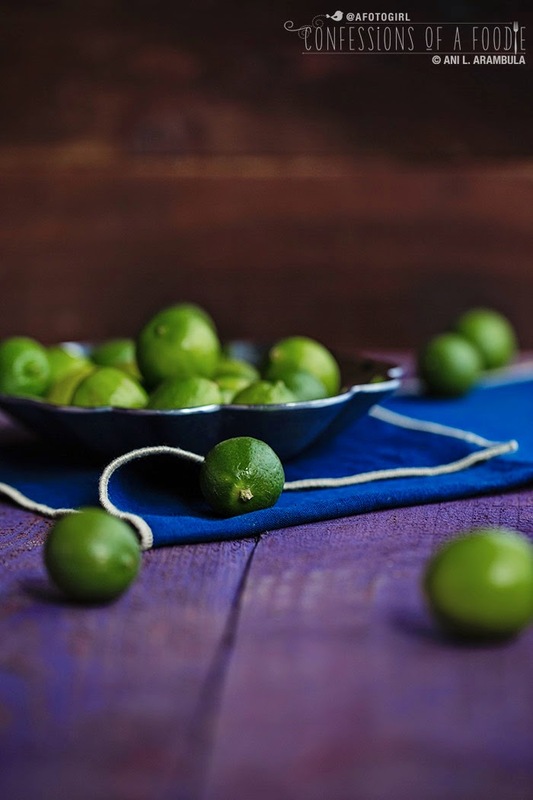 *Disclosure: Melissa's Produce supplied the fruit for this post. I was not otherwise compensated and am not compensated by Alex's Lemonade Stand Foundation for this post. As always, all opinions expressed are my own and not influence by the sponsorship.